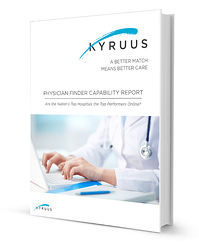 How Does Your Physician Finder Perform Against the Best Hospitals in the Country? We tested the functionality of Physician Finder sites at 40 of the top hospitals and health systems in the U.S. The results were surprising. The report highlights the difficulty in effectively matching patients with physicians, a nationwide issue that can lead to poor health outcomes for patients, ineffective use of physician time, and billions of dollars in wasteful spending across the entire United States healthcare system. 52.5% of the top U.S. hospitals and health systems fail to provide a means for patients to type in their condition or symptoms and find a clinically appropriate physician. 90% lack the capability to see if a doctor is available on a certain day or time. None of the top 40 hospitals or health systems provides patients with the ability to schedule their appointment online. Learn more about the disparity between patient preferences and hospital websites.